The rooster has left the coop. The Modern Letter Project is a collaboration between Corie Trancho-Robie and Youngna Park that seeks to revive the lost art of snail mail pen pals. Beginning in March 2007, 140 people joined with us on this journey of letter writing, eager to connect with others the old fashioned way and engage in the fun of new stationery and decorated envelopes, the slowness of postal services and mostly, the thrill of real mail once a month that wasn’t a credit card offer. It is our hope that, at end of the year we will have a network of new pen pals, friends, and a collection of letters to treasure. I feel it worth sharing because letter writing is a drum I beat from time to time at my site. Like you, I am somewhat chained to my e-mail – kind of difficult to run a blog without it, and easy to use, fast, “free” – wonderful for what it does. But listen: you know it’s different when you need to pay forty-whatever cents to send a letter, and when you’re writing it you want it to be worthwhile, thoughtful, not just something dashed off (as in “dude, I picked up the new Wilco, what’s on for next weekend, signed matty”) – email is to letter as instant message is to e-mail. Shorter and shorter, cramming it in. With a letter, you’re putting something physical out there, something that can be held, saved. I have a letter from my grandfather. His handwriting was shaky, unsure. His thoughts were unsure. You won’t get that same feeling through an e-mail. Who wants to leave behind no trace for their offspring, no sense of their thoughts and ideas and actual physical presence, save electrons (or whatever) in Google’s massive mainframe? And who is going to weed through your thirty thousand e-mails to find that one important thing you wrote? 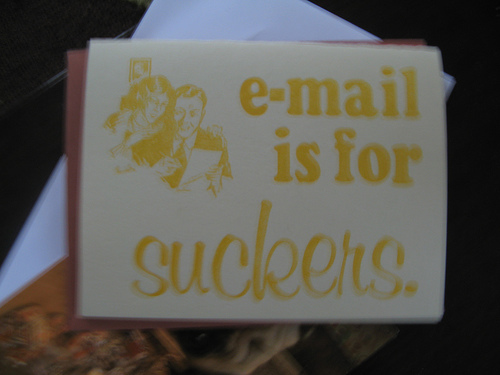 E-mail has recused people from letter writing, but I’m here to tell you it’s worth the time. Check this out, and get signed up at the LWP. Jesus H Christ! I just meet you Tiffany, and already you’ve got your miserable paws all over my breasts! Can’t you buy a girl a lousy drink first? I was just filing a post! Honest!